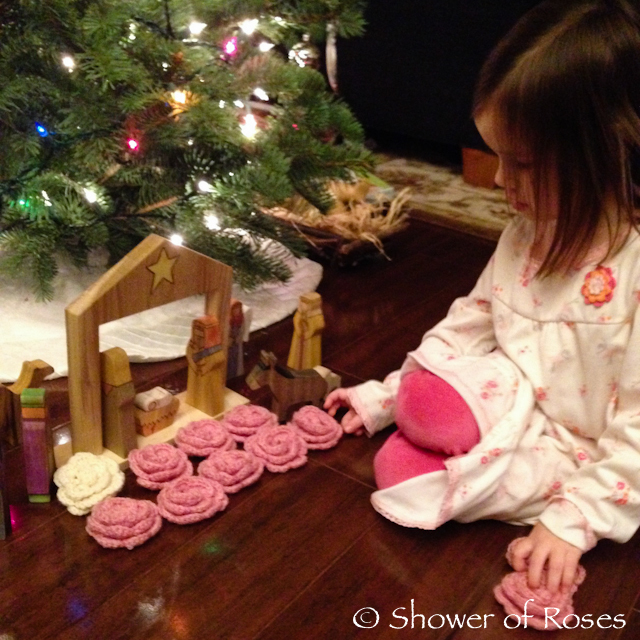 Rose loves lining up her new pink Rosary Roses five times for Baby Jesus during our family rosaries! My heart-cry Thy sweet Name. Today is the Feast of the Most Holy Name of Jesus on the new calendar and it is celebrated on January 5th on the traditional calendar. We will be reading The Saving Name of God the Son and coloring pictures from the Holy Name of Jesus Coloring Book. It is also the historical feast of St. Genevieve! You can find short stories about St. Genevieve in Saints: Lives and Illuminations, Once Upon a Time Saints, and Saints for Girls: A First Book for Little Catholic Girls (also available from TAN/Neumann Press - I'm dying to read this one to Rose, but I'm still saving it for her Easter Basket this year!). I've been busy organizing bookshelves and hope to share a complete list of books for January soon. I hope your new year is off to a blessed beginning! Many blessings to you and yours as well. 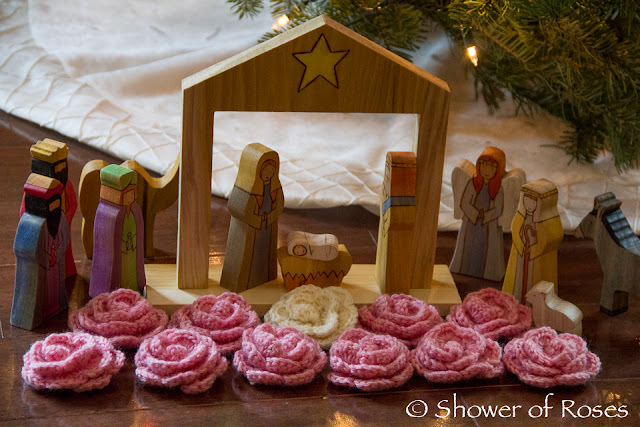 How beautiful the photos with baby Jesus. Touches my heart. So sweet! I love those roses! 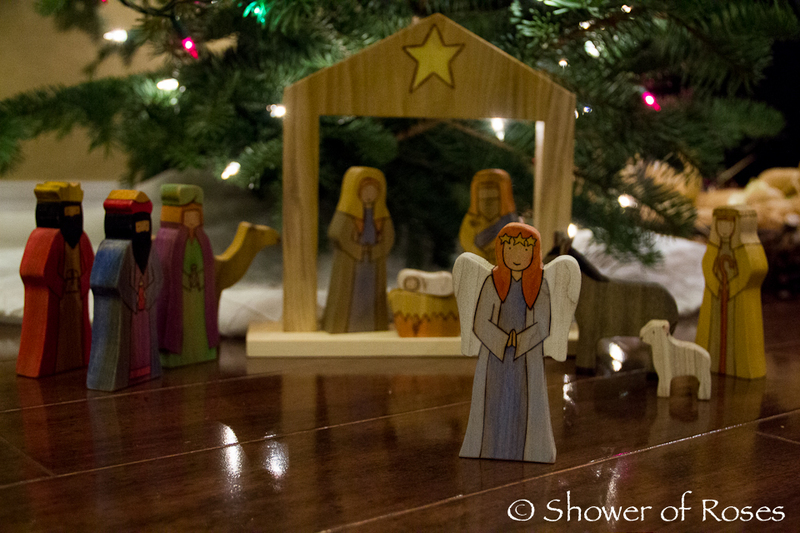 And that Nativity set is lovely, too. May I ask where you found it? I actually purchased the Nativity Set from Armadillo Dreams last summer (along with a St. Nicholas and Star Boy) during a special sale. I love it! How sweet to see Rose with her pink (naturally!) roses. How very dear of her to line them up like that for Baby Jesus and His Blessed Mother! It's always a treat and inspiration to see our goods 'in action'. 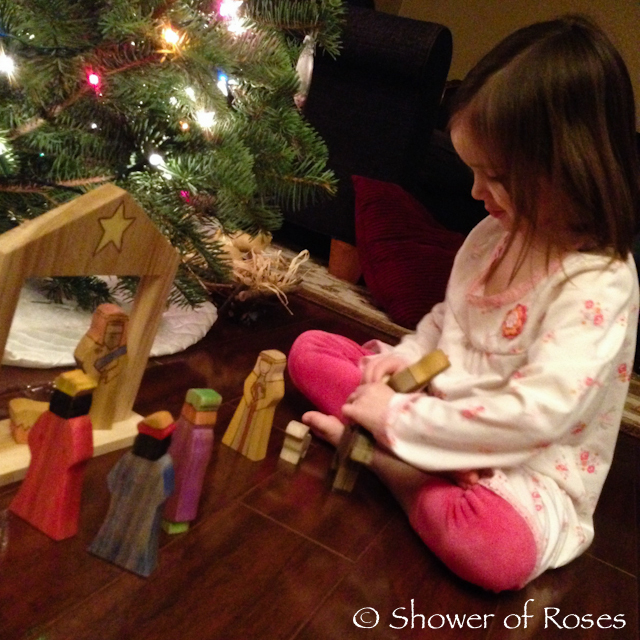 Kateri just got Jesus, Make Me Worthy for Christmas - such a treasure of a book for young ones. Blessed New Year to you and yours, dear Jessica! What blessed memories you share!! They serve so sweetly as meditations. What you capture is so brimming with grace! You put in your readers hearts a desire for ever more holiness. God bless your beloved family! Happy New Year! I just love Armadillo Dreams! That Nativity Set is precious!